Our vision: a thriving, equitable Northwest, powered by clean energy, inspiring the transition to sustainable prosperity across the nation and beyond. Our mission: accelerating clean energy solutions to the climate crisis. communicate a bold vision for solutions at scale required by climate science. Read about our values and our commitment to equity. Guidestar's Philanthropedia recently selected Climate Solutions as one of the nation’s 18 high-impact nonprofits working in the field of climate change—the only regional organization on the list. We have worked in the Northwest for close to 20 years. 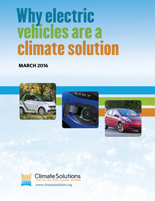 Read what climate and clean energy thought leaders have to say about Climate Solutions.